Two plates of lead are immersed in a glass vessel containing dilute sulphuric acid, and a current of about 2 A is passed between them from a battery in series with a rheostat (page 406) and an ammeter. After a time the plate at which the current enters the cell turns a deep chocolate brown colour, owing to the formation of a layer of leaduv) oxide (Pb02) on its surface. The cell is now disconnected from the circuit and connected to a small 2 V electric lamp. The lamp will glow for a short time as the cell sends a current through it in the reverse direction to that of the charging current. 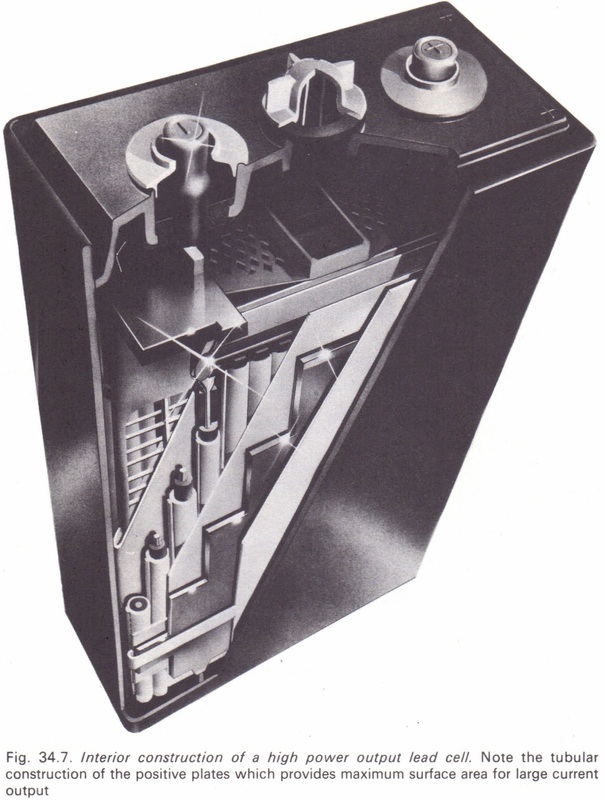 In the year 1860, Gaston Plante, who was then twenty-six years of age, utilized this principle in the design of the first practical form of storage cell. 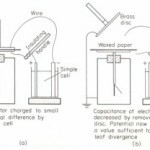 He found that if the charging and discharging process was carried out a great number of times the thickness of the lead dioxide layer gradually increased and the cell was able to supply current for a much longer period. In modern commercial practice the plates are made of grids of a lead-antimony alloy filled in with paste under hydraulic pressure. Red lead oxide (Pb304), is used for the positive plates and leadut) oxide (PbO) for the negative plates. On their first charge such plates become converted to Ieadnv) oxide (Pb02) and lead respectively. 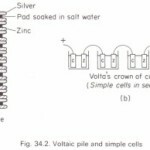 A low internal resistance which enables a lead cell to provide a very large current is achieved by having both sets of plates of as large a surface area as possible and placing them very close together (Fig. 34.7). The current capacity of an accumulator is measured in ampere-hours (Ah). Thus, a battery rated at 80 Ah will give a current of 8 A for 10 hours. It also might be expected to give a current of I A for 80 hours or 20 A for 4 hours. This, however, can be taken only as an approximation, since the capacity is generally very much greater for small currents than when it is discharged rapidly. Commercially, accumulators are rated at the “10 hour rate”, i.e., the ampere-hour capacity if discharged completely in a period of I0 hours. As a lead cell discharges, both sets of plates slowly change to lead sulphate and the acid becomes more dilute. 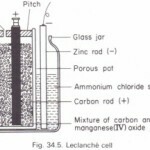 This causes the density of the acid to fall, so that the state of the cell may be ascertained by testing the acid by means of a bulb hydrometer (Fig. 12.7). When fully charged, the e.m.f. of a lead cell is 2.2 V and the relative density of the acid 1.25. The cell is regarded as fully discharged when the relative density of the acid has fallen to 1.15. These figures vary somewhat with differentmakes of cell.